Living in an older home that uses sewer lines will mean paying attention to how your drains are emptying and the water pressure that you have. 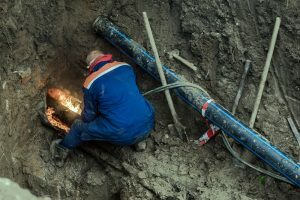 Whenever there are older lines in place, there could be some issues that are hidden under the surface that will need to be repaired time and again. Even if the sewer lines were installed properly right out of the gate, there could be leaking, corrosion, and materials that are simply out of date. No matter what you have going on, our team at Schleg Valley Construction will be happy to help you out with replacement sewer installation in Coupeville. Nobody likes to find out that they have pipes that have burst on their property. By the same token, any sort of a slow leak underground can be just as devastating over time. Corrosion is always a concern, as well as cracking due to a shift in the land and more. If you happen to have bushes or trees that are too close to your sewer lines, you could also be subject to root infiltration. This is an issue where the roots of trees or shrubs will tend to move toward the sewer lines and make their way inside the pipes. Not only can this lead to a leak that will cost you money over time and have the potential for contamination, but you could also be dealing with major clogs. Working with us at Schleg Valley Construction will help you by giving you the added peace of mind you need in knowing that you have professionals on your side. We will take the time to ensure your sewer installation is all done to code and that all of the right permits and paperwork is in place. Schleg Valley Construction is your answer when you are looking for quality sewer installation in Coupeville. Call (425)312-6750 for information!